This post will be talking about Star Wars: The Force Awakens. In particular, plot points surrounding John Boyega’s character, Finn. Should you not want to be spoiled, stop reading. As the title suggests, this post is the third of a series of posts, dealing with a specific source of criticism of the movie. The full explanation can be found here. FN-2187! Aren’t you a little too kind to be a Stormtrooper? Six of his 40 unforgivable plot holes dealt mostly with Finn, so I’ll list them here and examine their validity. If this doesn’t interest you, skip down a ways to where I give my thoughts on the young First Order defector. Errr, not sure how to answer this as a plot hole rebuttal. Has any list of plot holes ever cared less about (a) presenting something as a plot hole and (b) not really addressing it as such? Even Abramson says it’s okay. Alright, I guess the gist of his statement is that he wanted to see how Poe survived, or maybe have Poe die, or make us believe he was really dead? Is that what he’s saying? I don’t know. I knew Oscar Isaac’s character would return, so I never gave it a second thought. If this is to be considered lazy writing or whatever, I’d rather it be called out as such (and then I’d just call it lazy criticism) but I just don’t think this is a worthwhile point to debate. Apparently so. 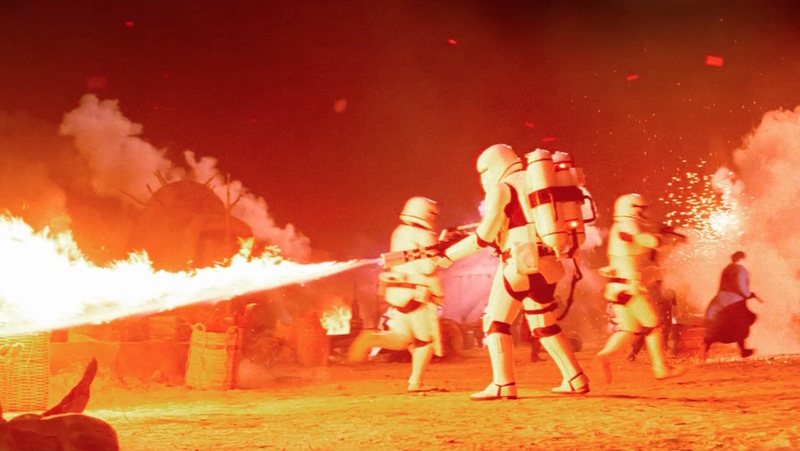 FN-2187 stated that this was his first combat mission. His only other duty mentioned was working sanitation on the Starkiller base. He probably wanted to refuse orders before, but those orders most likely involved cleaning toilets and he was smart enough not to refuse. On Jakku, we see one of the senior officers (with the red epaulets) position FN-2187 while they were rounding up villagers. The officer tells FN-2187 to “stand here.” That’s kind of what you’d expect from a veteran shepherding a newb on his first combat mission. So that’s consistent. 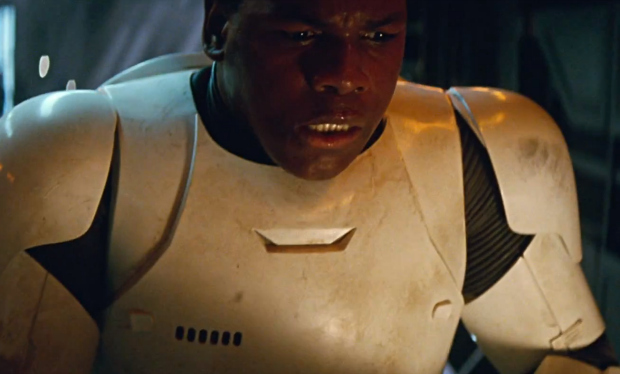 Is it logically inconsistent that Finn (I’ll dispense with the FN-2187 from now on) was on his first combat mission? Life is filled with firsts. Since the Starkiller Base had never been used before, it’s quite possible that Finn’s most recent years (when he was otherwise combat-ready) was spent on the base, working sanitation while the weapon was being built. I don’t know what in the movie implies otherwise. My question is why isn’t it obvious to Professor Abramson that Finn has legitimate concerns. Finn is considered a traitor to the First Order after freeing a high value Resistance pilot, one with connections to the Resistance’s goal in finding Luke Skywalker. And Finn was involved in keeping Poe’s droid that was carrying the Skywalker information away from the First Order. The Skywalker goal is something that seems priority #1 to Supreme Leader Snoke. I think it’s fair that Finn would not want to be recaptured. The riot control trooper on Takadana (Maz’s planet) recognized Finn by his face (as presumably did Kylo Ren when he yelled out “Traitor”) so Finn’s likeness had probably been distributed among First Order units in some kind of evil All Points Bulletin. Finn’s correct to want to get as far away as possible from the First Order. 28. How does Finn find Rey’s settlement, given that the film makes clear that all Finn can see, after his Tie Fighter crashes, is endless dunes in every direction? It would be a lame rebuttal of me to ask as counterpoint why the same Jawas who abducted C-3PO also managed to snag R2-D2, and then drive them to Uncle Owen’s farm, to find the one guy who would be interested in hooking R2 up with Ben Kenobi? That type of stuff happens in movies. But like I said, it would be lame of me to bring that up, so let’s forget I did. I’m not a fan of the assumption that Abramson makes. We never get a panoramic view from Finn’s location so we don’t see endless dunes in every direction. Endless dunes. And that huge structure sticking up, near Rey’s settlement. 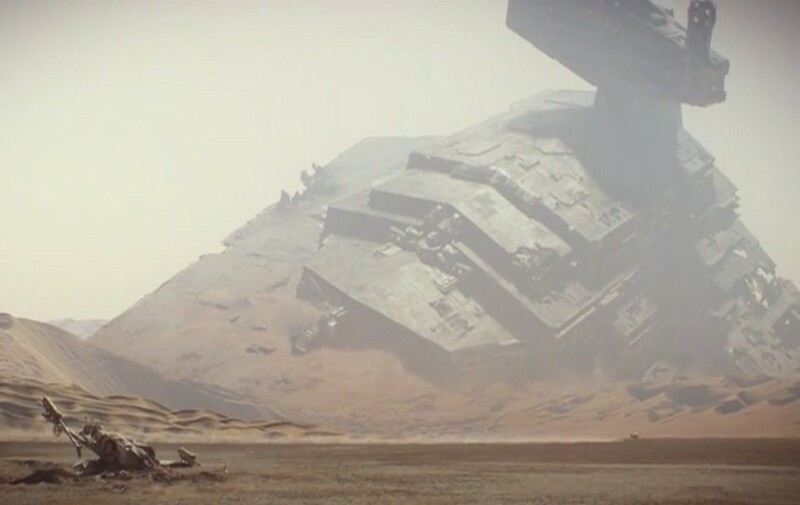 We know that there are huge landmarks on the horizon near Rey’s settlement, in the form of downed Star Destroyers. Anything like that could have been a reason for Finn to head off towards the settlement. I don’t think it’s a question that needs to be answered, really. 30. If Finn is such a good guy that he would try to save Rey the moment he saw she was in distress, doesn’t it further call into question just how in the world the order to kill civilians on Jakku was the first time he’d ever had qualms about doing something the First Order had asked him to do? No, not really. Wasn’t this already covered in plot hole #13 above? Look, the professor should really just drop all the atrocities stuff. Unless he has some proof that Finn is a bloody handed monster, I’m going to stick with Finn’s claim that Jakku was his first combat mission. One where he didn’t shoot anybody. BB-8! What? You were found by the guy that saved me from the First Order, and he brought you to the Resistance? I guess I’d better shoot him, or it’ll be a plot hole. 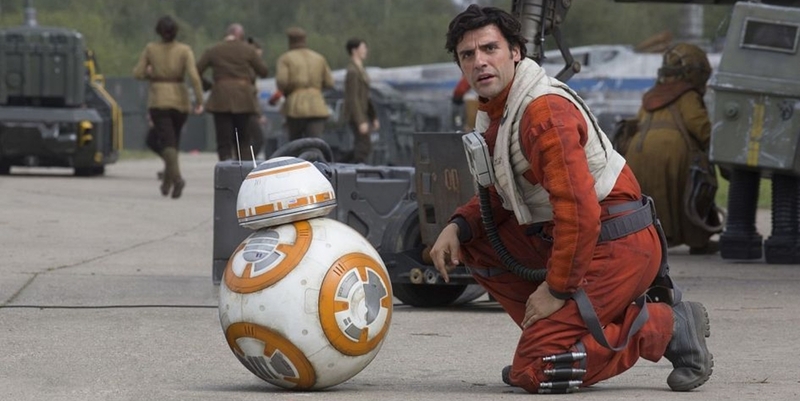 As for Poe Dameron clicking with Finn, I think it speaks highly of Poe. Finn broke him out of a Star Destroyer, and completed his mission of getting the key to Luke Skywalker, which is a big freaking deal, to the Resistance. Poe is a decent guy, and he had a good read on Finn. Who also happens to be a decent guy. The Star Wars movies are heavy with themes of friendship. They’re also not super-realistic. They’re aren’t Ron Moore’s Battlestar Galactica, where I might expect that level of suspicion, wariness, and cynicism. Finn is not just a new character, he’s a new type of character to the Star Wars universe. Someone who had been part of the Imperial war machine apparatus, and rejected it. John Boyega was charming as the defecting, terrified FN-2187, who was desperate to get away from the First Order but in classic Star Wars tradition, was willing to head into danger to save his friend. Like Han Solo riding out at sunset on frozen Hoth, to find his friend Luke. I enjoyed his attempts to pass himself off as a Resistance fighter (successfully to Rey, and probably unsuccessfully to Han Solo), and his role as the guy who keeps trying to help the girl who really doesn’t need to be helped. He was defeated twice while trying to wield Luke’s lightsaber, but I don’t think it spoke poorly of him for trying. Sometimes, the attempt is what matters. He did con Han into thinking he’d be instrumental in bringing down the shield on the Starkiller Base. Finn: We’ll use the Force! Han: THAT’S NOT HOW THE FORCE WORKS! Which turned out not to quite be a con, since he was instrumental in capturing Captain Phasma who could be forced to drop the shields. 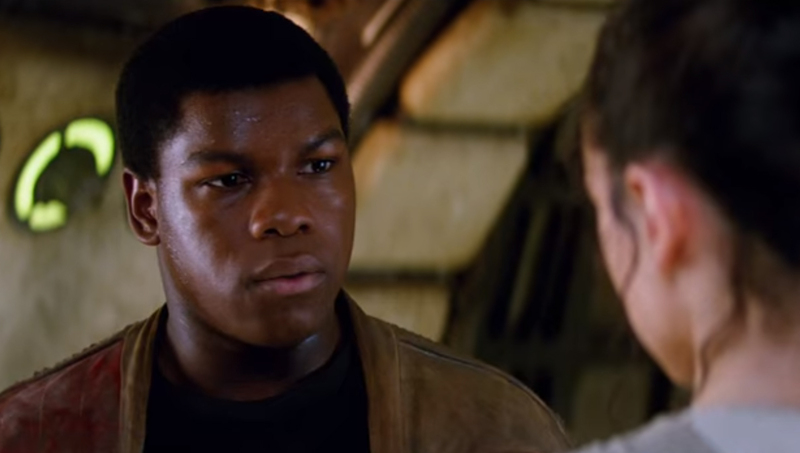 For me, Finn was extremely important in putting a human face on the otherwiseanonymous-by-design Stormtroopers. It brings a certain level of maturity and sadness to the movies now, considering that although the First Order soldiers are the bad guys, they’re also basically child soldiers. My hope, since Finn could reject the First Order, is that he can be instrumental in inspiring other Stormtroopers to defect. Wait a minute. If BB-8 is the new R2-D2, and you’re the new Luke, Leia, and Han… don’t tell me I’m the new C3PO. I’m Finn. Next post, I’ll talk about another member of the First Order: Kylo Ren, aka Ben Solo. And see if Professor Abramson got anything wrong about him. Comments are welcome. Super welcome! Images from The Force Awakens, obviously. I make no claims to the images, but some claims to the text. So there. Except for the plot hole quotes that Seth Abramson had in his HuffPo article. Obviously I make no claims to that text, and encourage you to read his entire work there. You’re not the only one. I remember that one of the original titles for Star Wars was something like The Adventures of Luke Starkiller, or something like that. Can’t wait to see your comments on Kylo Ren. Many people are already characterizing him as Disney’s next princess. LOL. I don’t think I make fun of him. There is some truth in that, I guess. Poor Goth Emo Kylo Ren. 14. – Has this guy ever MET a kid? Someone who is still young and forming their worldview usually starts out with that worldview being small and self-centered. I’m not calling Finn selfish, I’m calling him young and learning that there is a bigger world out there. He’s been under the thumb of the First Order most of his life, so he has a very narrow worldview starting out. He knows that nobody escapes from the FO and they ALWAYS get their man (or so their propaganda would have their members believe). So of course he thinks they’re out to get him – and they clearly ARE. Phasma and Ren both knew exactly which unit went haywire on their foray. 31. – Having worked with veterans in the real world, I can absolutely verify that if they see someone they’ve worked with before after they’ve survived a combat situation they get happy, assuming the previously known person wasn’t a giant d*ck. Especially since they work in very dangerous conditions and never know when or who they won’t see again. Also, Poe was just a genuinely nice person – you can see on Finn’s face after that reunion that he finally is among friends, is getting that human, kind interaction he never had before. AND IT’S THE BEST. Seriously, I think Abramson was going more for quantity than quality with this list. Some of his points are easily explained by even casual filmgoers and not rabid fans (like us). CAPITAL post, man! This is the good stuff! Are you going to do a big ‘HERE ARE THE THEORIES’ post? Wow, thank you so much for talking about your experience with veterans. It mirrors exactly what I was thinking about when Poe sees Finn. When I wrap all of this up, I’ll work out some theories, but it’ll be mostly just my thoughts. Please feel free to contribute theories that you’ve heard of or came up with. You’re pretty wise in these things. On # 28, I play the “You Have to Allow Coincidences in Movies or They’re Not Interesting” card. Set aside the point of Finn finding the right settlement. Given an entire planet on which to crash, why did he land anywhere near it at all? Because otherwise we wouldn’t have a movie. How is it that BB-8 ended up with Rey, and not somebody else? Because otherwise we wouldn’t etc. etc. etc. It’s a movie. Coincidences drive movies. Yeah, exactly. I completely agree. Sometimes, coincidences are a bit tortured and hard to accept, but not this. There’s no way that it’s an unforgivable plot hole. I agree that these Finn related plot holes are particularly weak. And it’s also a good point that he is a new type of character – looking for the character types that I’ve already enjoyed watching, I didn’t think so much about the new stuff. Professor Abramson, thanks for the link. I’ll definitely reference it when I get to my wrap-up post. “That kind of thing happens in movies” – oh yeah, like, the first time the Falcon gets off Jakku in years, and it happens to run right into Han’s boat.Instead of running into the FO elements that are raiding Jakku right then. Double miracle 😉 (Basically, the thundering ineptitude of the FO – from inability to intercept a crashing Tie fighter and grab the pilot – EVEN WHEN THEY KNOW WHERE IT WILL LAND — to their inability to intercept any odd ship coming off same planet, to – well, the list goes on. They don’t deserve to be considered a military organization! OK Patrick I’ll catch up with the rest next week. Keep up the good work! As soon as I get the latest GOT on DVD so I can catch up I plan to read your series on that as well. Thumbs up, and thank you! Tying Finn to the atrocities that the First Order committed – when he was a janitor – ties back to the whole idea of the Empire as the Nazis. And that same question – to what level was everyone who was a Nazi complicit for everything they ever did? The whole country of Germany? Etc etc. Somewhere the line must be drawn, and probably somewhere above the paygrade of the janitor-handed-a-gun-and-told-to-shoot. Especially a janitor conscripted as a child. Nonetheless I want to add one other point: I super want to know more of Finn’s backstory! He finds himself to be really good at some skills (like turret shooting), and is not the worst with a lightsaber. In other words, he reminds me of some untrained Force-adepts in past movies. And, he seems to be kind of unique in standing up to the First Order, so there’s something a little extra and special about him. So what is his background, rightfully unknown to him? I hope this is later explored, and perhaps as a foil to Rey similarly learning about her background, and us learning more about Ben’s background. I think we can suspend Godwin’s Law for this discussion, since we’re talking about Space Nazis. I also think Finn has a cool backstory, and maybe some cool interactions with First Order elements to come. Finn was my absolute favorite character – he made being the everyman so compelling, which is darn hard to do! Agree that none of those picked on points make any sense. Right on. I really liked Finn.